Many of today's U.S. military aircraft entered service decades ago, and keeping them mission-ready can be a challenge. U.S. military aircraft face ground-based anti-aircraft dangers in several parts of the world. Georgia Tech Research Institute (GTRI) engineers are helping U.S. airplanes and helicopters to avoid enemy missiles and ground fire and to respond with effective defensive measures if attacked. GTRI designs and develops substantial components of the software that operates the integrated defensive avionics - a complex system of radar and missile warning sensors, signal-jamming devices, and other defensive equipment - on two main Air Force aircraft, the C-130 Hercules transport and the MH-53 helicopter. GTRI is also involved with integrated defense avionics development for the Air National Guard's F-16 and A-10 aircraft. 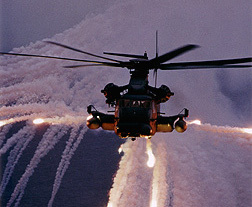 "Our work first involves situational awareness, to make sure that aircraft avoid the areas where they could be engaged by missiles or anti-aircraft guns, and the second part involves assisting the crew in employing countermeasures to protect itself," says Joe Brooks, a research engineer with GTRI's Electronic Systems Laboratory (ELSYS) and a lead researcher on the MH-53 program. Working mostly with the Warner Robins Air Logistics Center, GTRI focuses on defensive system integration - connecting the sensors that detect enemy threats to the cockpit displays that inform crews about those threats. GTRI's software integrates reports from multiple sensors to reduce crew workload and reduce ambiguous reports, and provides automated threat response strategies that can be programmed to operate with or without crew interaction. Such software gives the aircrew early warnings about potential threats at long distance. If the crew cannot simply fly around enemy threats, GTRI's software either alerts them to take manual countermeasures, or it responds automatically to avoid or neutralize incoming missiles or ground fire. "In the past, those sensors would have lit a light or set off an audible tone to alert the aircrew," Brooks says. "We're trying to improve how that information is presented to the aircrew by putting it on the glass cockpit display, and in some cases we are enabling the defensive systems to respond to threats automatically." Of course, aircrews can only employ their situation-awareness and threat-response systems when flying over enemy territory. To prepare for such confrontations, GTRI has also developed a Virtual Electronic Combat Training System (VECTS) that uses simulated threat systems and the actual cockpit displays to simulate attack scenarios on the aircraft. This system provides the aircrew with a real-world training experience that includes not only threat warnings, but also accurate responses to countermeasures and aircraft maneuvers. "VECTS is there so that the crew can practice with their defensive avionics system and be prepared," Brooks says. "Otherwise, the only time the system is used is when somebody is shooting at them, or when they go to a training range, which is not always available." GTRI is taking part in a major Boeing-led program to improve the workhorse C-130, says Tom McDermott, an ELSYS research engineer who is a leader on the C-130 program. Called the C-130 Avionics Modernization Program, the project will put entirely new digital cockpit and flight-related electronic equipment on the venerable transport aircraft, whose first variant entered service in 1956. The upgrade includes new mission computers that integrate the aircraft communication and navigation systems, radar systems, defensive systems and flight management functions onto common cockpit controls and displays. Boeing selected GTRI to perform the critical defensive systems integration task. GTRI originally demonstrated the benefits of defensive system integration and embedded training for C-130 aircrews in the mid 1990s under an Air Force-sponsored laboratory development project. 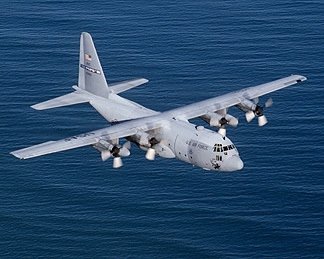 Now as part of the C-130 Avionics Modernization Program, ELSYS is converting this prototype software to the production flight qualified software that will actually run on the aircraft's embedded mission computers. ELSYS has a long history of delivering operational flight software to U.S. military forces and allies. The development of production-level software for defense avionics is supported by ELSYS' certification in 2003 as a Software Engineering Institute Capability Maturity Model (CMM) Level 3 organization. The CMM is a model for judging the maturity of an organization's software processes and for identifying the key practices required to increase the maturity of these processes. Its goal is to improve the ability of organizations to develop high-quality software within budget and on schedule. Developed and administered by the Software Engineering Institute at Carnegie Mellon University, the Software CMM has become the de facto standard for assessing and improving software processes. "The C-130 Avionics Modernization Program is going to install all-new avionics in old C-130s," McDermott says. "The defensive system integration system that we develop will significantly improve crew situational awareness of hostile threats and aid in the protection of the aircraft and crew on critical missions of national defense."